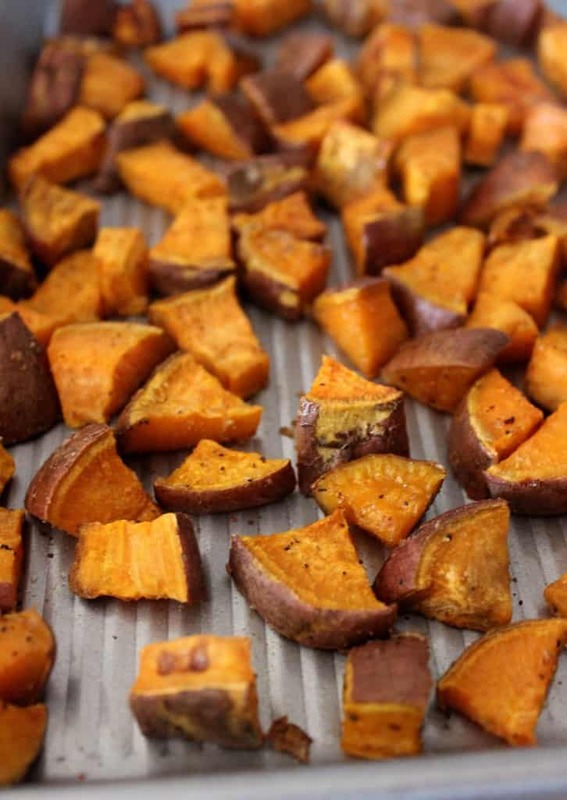 These simple roasted sweet potatoes are an easy side dish that everyone loves! Follow just a few simple steps for perfectly crispy roasted potatoes. I haven’t always been a big fan of sweet potatoes, but I’ve started really liking them over the past few years. Learning how to roast sweet potatoes initially helped me get over the “mush factor” in regular baked sweet potatoes, and now I even like regular baked sweet potatoes! Roasted sweet potatoes are so versatile, and I’ve experimented with making them several different ways. You can leave the skin on or peel it, cut them into circles, long wedges like fries, or smaller cubes, and season them with either sweet or savory spices. My main requirement is that they HAVE to be crispy, because who likes mushy potatoes? I purchased this baking sheet from Amazon several month ago and the raised edges make it a dream for roasting veggies! I like to cover it with this natural parchment paper for easy clean-up. a) Not fully peeling the sweet potatoes. The skin gets crispy and crinkly, it has lots of great nutrients, and not having to peel the potatoes is a big time-saver. Just make sure that you wash and scrub them so they’re really clean. My favorite way to make them is just peeling some of the skin, so it’s crispy and you get that great flavor, but without the chewiness of all of the skin. b) Cutting the potatoes into small wedges or thin strips. While you can definitely cut them into thick strips, they’ll be softer rather than crispy, and they’ll take longer to cook. c) Using savory spices instead of sweet spices. While cinnamon, sugar, and sweet potatoes have a place together on the Thanksgiving table, I’ve found that I actually prefer savory spices like salt, pepper, and garlic on my roasted sweet potatoes. That way, they’re more versatile and can go along with more main dishes! 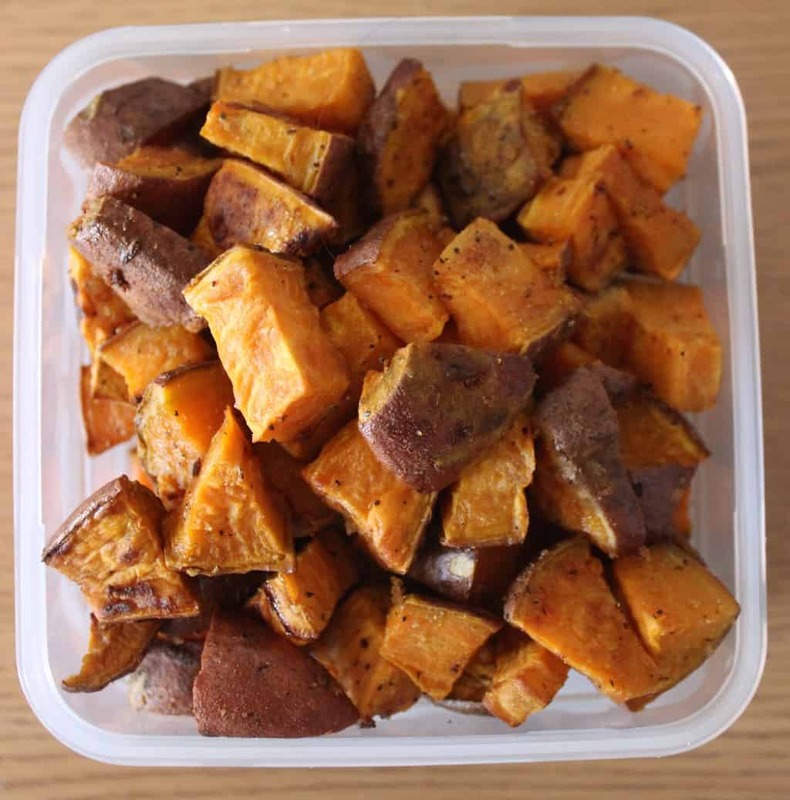 Over the past couple of weekends, I’ve prepped sweet potatoes ahead of time to have with lunches and dinners throughout the week, and when I get hungry, I’m so glad I have sweet potatoes ready to go! 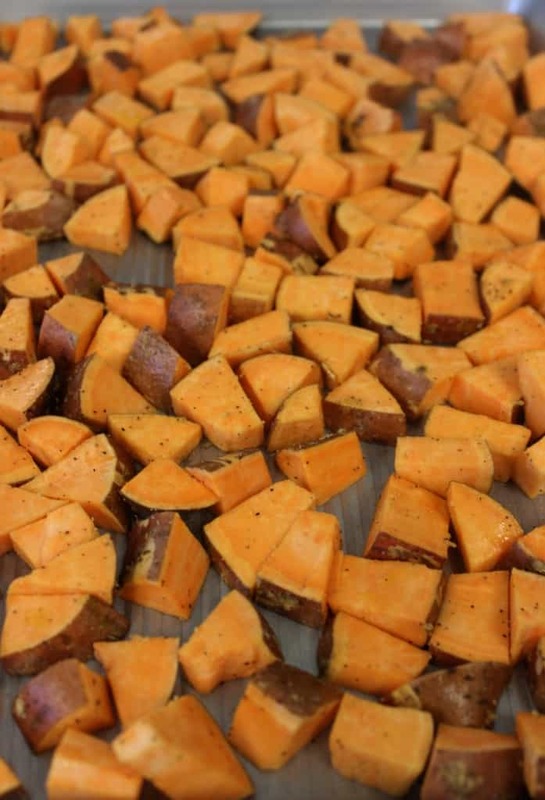 Hope you love these simple roasted sweet potatoes as much as I do! If you make them, feel free to let me know in a comment or take a picture and tag me @livbane on Instagram! Wash and scrub sweet potatoes thoroughly. There's no need to fully peel them, but I often quickly run a peeler over them and peel about half of the skin. Dry potatoes well with a towel or paper towel. Cut sweet potatoes in half length-wise, and then cut each half into 4 long strips. Chop each of the strips into small cubes, about 1/2 thick. Line a large baking sheet with parchment paper. Spread onto baking sheet, drizzle with 2 teaspoons of olive oil, and sprinkle with garlic powder, salt, and black pepper. Toss to coat. Bake at 400 degrees for 25-30 minutes or until crisped, flipping once halfway through to make sure that both sides get crispy. Turn broiler on low for 60 seconds at the end if needed to get crispy. 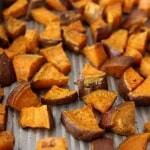 For best results, reheat leftover roasted sweet potatoes in skillet or in oven rather than in microwave. If reheating in the microwave, heat on medium power. oh my gosh I am OBSESSED with roasted sweet potatoes. I roast mine with coconut oil and always end up eating the whole pan On accident! Sweet potatoes are my jam lately! I seriously think I could eat them everyday and be completely ok. I love any form of sweet potatoes. Some days I like them savory (rosemary, garlic salt) and some days I like them sweet (coconut oil and cinnamon). You can’t go wrong! I roast sweet potatoes every week! I swear my house smells of sweet potatoes. Who needs candles/air fresheners? 🙂 I also prefer them on the savory side! Have a great weekend! I love sweet potatoes and make them often. When my boys were little, we used to mix mashed sweet potato with almond butter and maple syrup and make this crazy sweet potato spread for rice cakes. Oh the 90s…. Mmm, that sounds like a delicious combination! I used to eat rice cakes with almond butter all the time but haven’t had them in forever. I’m obsessed with roasted sweet potatoes. We have them a few times a week. This is how I roast them almost every time! Sweet potatoes are so versatile. You can put them in pretty much everything. I love how quick and easy your recipe is! I, too, love sweet potatoes! Thanks for listing all the variations in one place, it helps me remember to mix things up once in a while. Yes, so glad you’re another sweet potato lover! They’re cheap and easy to make, so what’s not to love for a college student?! Haha! I love sweet potatoes! Especially the loaded and fried form 😉 Yum! Have a great weekend, girl! Hope you’re having a wonderful weekend, too, Kate! They’re so healthy and best of all, crazy cheap 🙂 I think most of my friends love sweet potatoes now, too! Aww thanks, Liz! Hope you’re having a great long weekend! I do many versions of this dish year round. 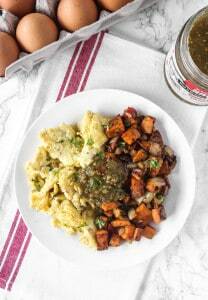 The sweet potatoes go with anything from a heavy, braised meat dish to a light, potluck-style potato salad. The roast on them brings out that fabulous sweetness. Love! I love sweet potatoes! I usually mash a few each week to keep on hand as a healthy snack. I’ve never tried roasting them, but they look super yummy in your picture. For some reason, I’m not a huge fan of mashed sweet potatoes! Something about the mushy texture, maybe? But I love crispy sweet potatoes, so if you like crispy things, it’d definitely be worth a try at roasting them! This is how I make my sweet potato over fries. I like to cut them in wedges because it makes them easier to dip in my favorite sauces. Do you have a favorite sauce? Love love love sweet potatoes! They’re so versatile. When I’m in a pinch I’ll just cook up a tater and sautee some veggies and call it a day. They’re also one of my favorite pre-run meals. 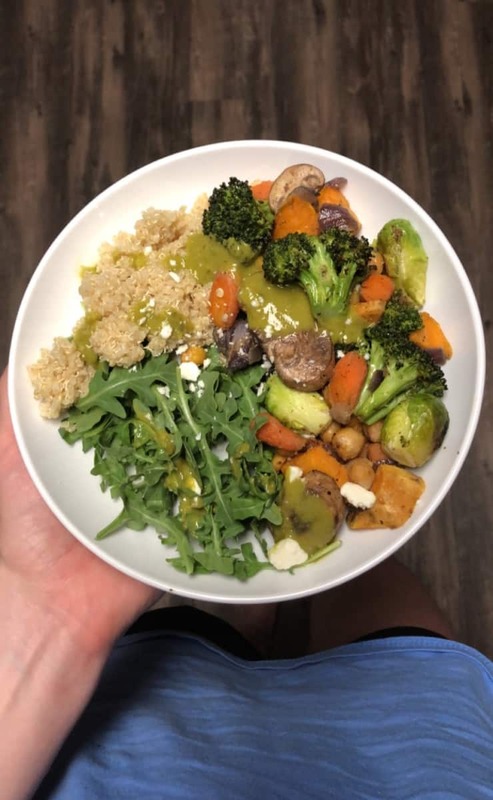 Roast veggies often frequent my dinner table so this recipe is ideal for me. I have to make it! Those look amazing! I don’t think I’ve ever tried roasted sweet potatoes, but they seem like they would be delicious! Odd question, but what kind of pan are you using, and where did you get it from? it looks like is raised, which i really like. thanks!! Hi, Stacey! It’s a 13×8 inch jelly roll pan from Bed Bath & Beyond. The ridges on the pan are really useful for non-stick purposes. Here’s the link to it on their website! My favorite! I make them to eat with omelettes or hamburgers or for a mid-afternoon snack. I coat them in avocado oil and use lots of salt, pepper and garlic powder. They are delicious! What are the calories of this recipe? 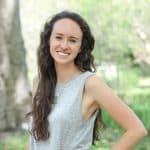 Hi, Mishelle! The calories will depend on the size of your sweet potatoes. If you can weigh your sweet potatoes, you can plug the info into an online nutrition calculator along with the other ingredients. Hope that helps! How do you cook the sweet potatoes the night before? How do you get them to crisp up? While I like that this recipe doesn’t use much oil, for me they do not turn out crispy at all in 35 minutes, not even with broiler for a couple minutes at the end. My pieces looked similar size to yours and I had them more loosely packed on sheet so they wouldn’t steam each other. Next time I will try with a hotter temp and only one sweet potato at a time and more finely cut. I tried this last night. I peeled them and cut them in small squares. Next time I will cut them larger (They got too soft) and, against my personal preference, I’ll leave the skins on. I also roasted some brussel sprouts that I had on hand and mixed both together with the savory method and all in all, it was a nice change from just baking the sweet potatoes as I generally do. My hubby of 45 years really liked the change! Thanks for this recipe. So glad you and your husband enjoyed this recipe!! I was brought up eating sweet potatoes, My grandfather grew sweet potatoes by the acre, so most of our potatoes were eaten fresh. My favorite is coating the sweet potatoe in butter and bake till the outer layer is carmelized, open the potatoe and fill with brown sugar and enjoy. Baked with skin.